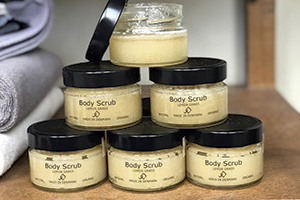 Our costumers satisfaction are an important parameter for us, and it is based on a request for a body scrub with fine grain, that we revisited the ingredients and has chosen to replace the demerara cane sugar with finer grains. Of course it is still organic. The effect is still the same, but the ‘scrub-maneuver’ feels gentler, which means that extra sensitive skin will love this formula. However, we still advise against using the scrub on the face. We are actually loving the new formula ourselves. With the soft and yet still effective touch, so thank you Sofie for the request!